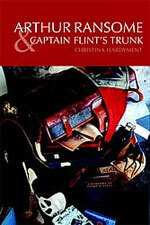 My latest obsession started two months ago with Christina Hardyment’s Arthur Ransome and Captain Flint’s Trunk, an excellent study of the sources, both geographic and human, for his famous books, with a satisfying number of illustrations as well. Fans probably already know that Ransome is Captain Flint, the Amazons’ grouchy uncle and author of Mixed Moss. What becomes clear in Hardyment’s book is that Mixed Moss, although not a real book, hints at Ransome’s thrilling life of world travel, fishing, and messing about in boats. Ransome, born in 1884 and the eldest of four, fell in love with the Lake District during summer holidays when he was young. He seems to have always wanted to write fiction, but an early (and eventually disastrous) marriage forced him into a career as a journalist. 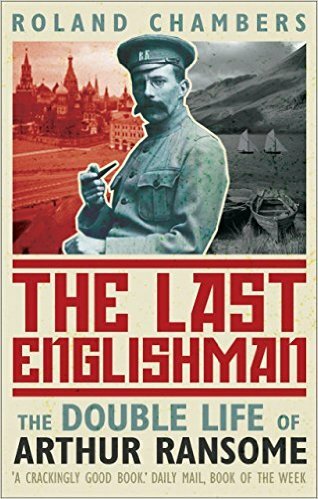 An urgent need to leave England (the result of a lawsuit involving his critical study of Oscar Wilde) sent him to Russia just as the Tsar was going into freefall, giving Ransome a ring-side seat for the coming turmoil of revolution, WWI and civil war. Ransome’s dispatches from St Petersburg and Moscow reveal a naive reporter unaware of how he was being used by both British and Russian acquaintances. Ransome knew Radek, Trotsky, Lenin, Kerensky, and others. He acted as go-between for British and Russian diplomats. Had he been a top-notch journalist, he could have used his experiences as the basis for an outstanding history of those critical years between his arrival in 1913 and Lenin’s death in 1924. Yet he was clearly missing something that separates a reporter from those who are just passing through. 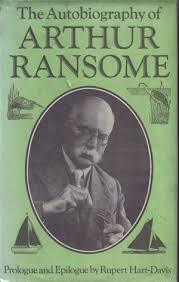 It’s difficult to pin down, but, after reading Chamber’s profile of Ransome, along with Ransome’s own memories of those days, a few things stand out. In his Autobiography, Ransome makes almost no mention of his younger brother, who died in France in 1917, nor of his sisters. He includes no photos of them. He mentions his own daughter once or twice, but shows little more interest than if she were a barely tolerated pet he’d left in the care of a neighbor. He doesn’t acknowledge the horrors of the revolution and civil war playing out around him — he seems, in fact, to walk through battle-torn areas in a protective bubble, never hurt, rarely threatened, and only mildly concerned. He’s dismayed at the loss of his belongings, but pooh-poohs the deaths of millions. So, problem one: not enough empathy. 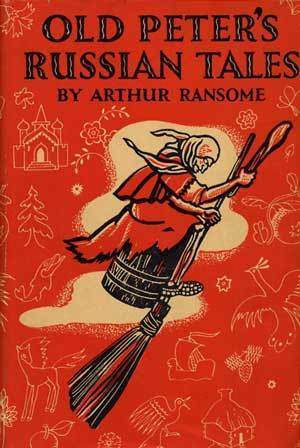 Ransome leaves valuable notes, documents and books in his various apartments in Russia each time he travels back to England for his annual holiday, barely registers the murders of the Tsar’s family, and finds the revolution and civil war, although interesting, an irritating interruption of his research on Russian folktales. He actually hated his job, later admitting that the nearly two decades he spent writing for newspapers had been a useless (although lucrative) sidetrack from what he had really wanted to do, which was to write for children. Whenever he could get away from the demands of his job, it was to go fishing and to study Russian folktales. He shows no regret at being in England (fishing, of course) during the October Revolution; he could find out what he missed on his return. Problem two: not enough curiosity. What’s more, his ease with learning Russian and the fact that he was often the only journalist around from the English-speaking world must have lulled him into thinking he was quickly becoming an expert on the situation. His friend Radek, Vice-Commissar for Foreign Affairs (i.e., the guy in charge of PR and propaganda), no doubt used Ransome as a conduit for favorable reports to Britain and the U.S. on the outcome of the Revolution. Ransome questioned nothing and made no effort to talk to anyone else. He had fallen in love with Trotsky’s private secretary, which probably made him even more susceptible to heart-warming tales of the Glorious Revolution. Problem three: not enough doubts. So, ok, Ransome was not meant to be a journalist. This was probably why he suffered from ulcers and various intestinal ailments during those years in Russia, which always diminished during his fishing holidays in England. It’s a good thing he quit, but not before being sent first to Egypt and then on a separate trip to China (inspiration for Missee Lee, so perhaps we should be grateful he held on to the job as long as he did). Old Peter’s Russian Tales, published in 1916 — two years into WWI and three years into his long stay in Russia — is the fruit of Ransome’s research in Russia, and actually quite good. 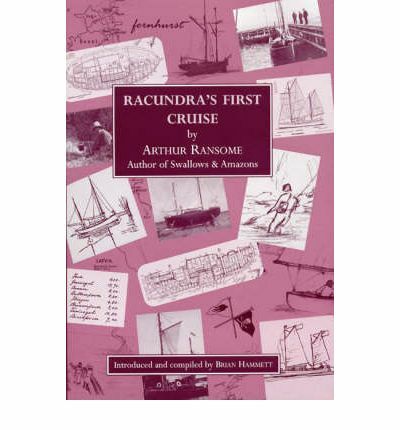 The book sold well, but it took another seven years before his next success, Racundra’s First Cruise (1923). This is Ransome at his best, and it explains so much of what can be found in the Swallows and Amazons series (from Peter Duck to We Didn’t Mean to Go to Sea). Soon after RFC was published, Ransome was divorced from his first wife and married to his second. And then he began his immortal series. There’s no reason to require that a man who writes for children (or for any other audience) be a model citizen, loving parent, supportive friend, and honorable gentleman. I can get past Ransome’s blinkered assessment of the events in Russia, but it’s difficult to sympathize with someone so callously cruel to his daughter, so incapable of seeing her side — of even imagining that she had a side. Many of the people he befriended during his years in Russia later severed connections with him. He even had a falling out with the family who inspired the Walker and Blackett characters. Did he dislike children in general, or only those he knew personally? What he never fell out with, however, was his beloved Lake District. Fishing, boating, walking, living there — these were what he wanted most. If the Walker children seem too tame and polite, if the situations too unbelievable, Ransome at least gives us a place (more than one, if we include the Norfolk Broads) that draws us back, again and again. A final note: Ransome knew John Reed (Warren Beatty’s character in Reds) and Sidney Reilly (Sam Neill’s character in Reilly, Ace of Spies). Does this mean someone could have played Ransome in a small role in each of these? 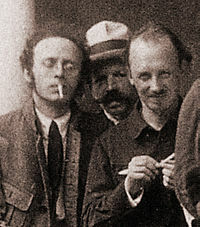 The caption for the photo on the right, from Wikipedia, identifies Radek (left) and Bukharin (right). Could that be Ransome in the middle, with the walrus mustache? The nose and chin are wrong, but I like to think so. This entry was posted in Adventure, Artist profile, History, Mystery, reading and tagged Arthur Ransome, Christina Hardyment, Roland Chambers. Bookmark the permalink. I’ll be returning to this post when my schedule pencils in a season of Arthur Ransome books. Brilliant! Thank you, Simon. I hope you come back to add your own take on Ransome. At some stage I must complete Old Peter’s Russian Tales — can’t think when or why I put it on pause, at it were. Ransome’s antipathy to children extended to the young Diana Wynne Jones and her sisters (who’d been evacuated to the Lake District during the war) as I’ve mentioned a couple of times on my blog (eg http://wp.me/s2oNj1-wilkins). I remember seeing a BBC documentary-drama about Ransome (could be this one from 2006 http://www.bbc.co.uk/programmes/p02t9tmf though I thought it was more recent) about his life in Russia. Griff Rhys Jones’ video isn’t available in the US, so I’ll have to see it on my next UK trip. Amazing how many paths crossed Ransome’s — now I can add DWJ to the list. DWJ or her siblings also fell foul of Beatrix Potter at the same period, according to Reflections, makes me wonder if Ransome and Potter ever met (likely, surely, in such a small community?) and if so what they made of each other. Two child-hating grumps would have had much in common one would think! I had been wondering if Potter and Ransome had crossed paths. Living so close, they must have had at least a nodding acquaintance. Possible research topic.